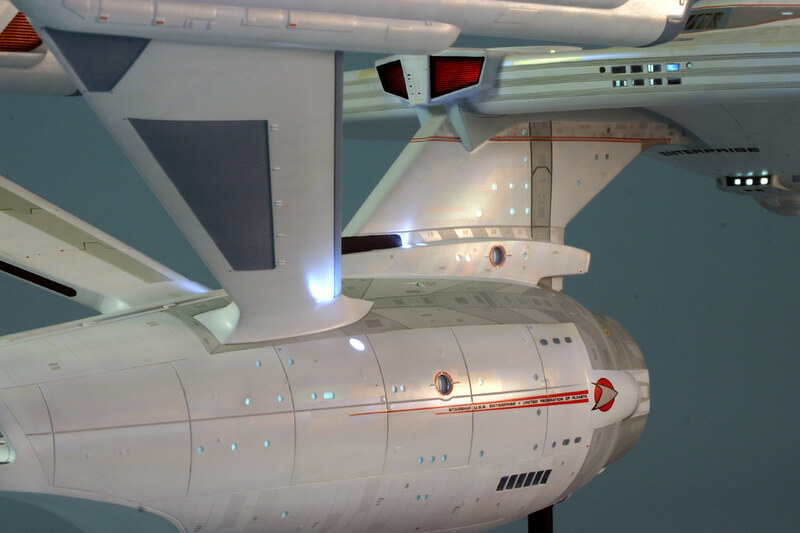 I've begun my Enterprise Refit build after many hours of viewing videos, reading web pages, studying the model and its parts, diagrams, pictures, and so on. What I have found is that the key to a successful build is similar to what they say about the value of real estate, being all about "Location, location, location". it's "Preparation, preparation, preparation" for us modelers. A close second to that would be "Planning, planning, planning". So what I've done so far is the boring prep stuff like washing, trimming and test fitting parts; mainly the saucer section and shuttle/hangar bay. It's been fun. I've also gone ahead and built 2 of the shuttles just to get a feel for handling very small parts. 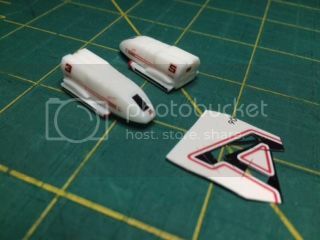 I'm going to do a little painting on the shuttles and apply decals, again with the goal in mind to get used to handling and establishing muscle-memory. The biggest temptation for me is getting into a big hurry. I work in an industry where the clock rules everything you do. It's refreshing to be able to do something like this and be on my own schedule. I'm willing to bet that there are some of you who know what I mean! When I figure out how to post some pictures, I'll do that as the build progresses. Back to the kitchen sink for more parts washing! You've got the right mindset for building the big Refit. I would add that if/when it becomes tedious & seems overwhelming then step back, relax, and maybe take a break from it for a while. Maybe have another simple project on the side that you can work on (Bandai Star Wars kits come to mind, or damned near any Tamiya airplane model). The last thing you want to do is press on in frustration and make careless mistakes. Thanks for the encouragement CrowT! Appreciate it. Ordered and received my Paragrafix Refit Photoetch and decal sets. I've also been picking up various small stuff like brushes, adhesives, etc. I've got plenty to do between now and when it comes time to add the electronics & lights. Still pondering how far I want to go with that. Since I don't own an airbrush at present I am considering decals for the Aztec effects, but not final on my decision. That is also a ways from now. My main methodology for this build is based on Boyd's YouTube tutorials, which are excellent. Anyway, hope everyone has a great weekend. For our modeling brothers & sisters in the southeast, stay safe while Florence is around. Since I don't own an airbrush at present I am considering decals for the Aztec effects, but not final on my decision. IMHO, an airbrush is the single most important modeling tool you can own. It's an investment that will pay-off many times over as you build more models. Learning how to use one (and it's not difficult) will vastly improve the outcome of every model you build. An airbrush would still be very useful even if you use aztec decals because there are numerous other details that need to be painted. If you can, bite the bullet and get an airbrush + a suitable air source now. You won't regret it. I use an Iwata Eclipse HP-CS brush with a Sparmax TC2000 compressor, and they've served me well. Thanks again CrowT! That airbrush/compressor combo would be quite the investment! Shuttlecraft Complete! Man, those decals are TINY! The black windshield and engine side stripes don't come with the kit decals, so I cut them out of the extra -A that I didn't plan on using. My refit will be the Enterprise as she was post-TMP and pre-TWOK attack by the Reliant. I'm only going to make 2 shuttles for this build. I also began the Dremel process preparing the saucer section for lights. Having a great time! You might consider this airbrush compressor option. Both work well and you can upgrade the airbrush once you master the basics if you desire. Thanks Tshark! That's more in line with my affordability factor, although I'd love to be able to get the one that CrowT suggested. I started with an old Badger 200 using compressed air in cans! The set that TShark posted is way better than that. Made some nice headway on the upper saucer section. Following Boyd's & Matt's guidance, I removed segments of the inner walls to permit light to show through the windows on the saucer edge. I'm sure this was a task many or most of you did early on in your build. At first it was rather intimidating but I gained more confidence with time. Very happy with the results. Refer to the picture above. I'm in a quandary with respect to the windows themselves. In all the videos I've watched, I don't recall that anyone has mentioned the clear plastic windows that come with the kit. I don't see them installed at all on the builds, or if they were no mention was made of them. It doesn't appear that they can be installed once the walls are installed, and if you do install them you can't very well paint the walls or the saucer without masking the clear plastic windows, and that would be a big PITA, I'm sure. I do recall either Boyd or Matt or someone else talking about using canopy glue to fill in the tiny window openings; the glue itself becoming a window. Would one (or more) of you fellow modelers enlighten me about this? I'm reluctant to continue wth wall installation until I get some clarity on this. Many, many thanks! 1. At what point in the build process did you apply the Envirotex? Before or after assembly? Before or after paint? Did you have to mask it? 2. So the Scotch tape doesn't stick to the cured Envirotex? 3. Did you use this technique on every window (except for the officer's lounge and arboretum, of course)? 4. Is it brushed on or poured on? I tried the same technique using acrylic nail powder on a 1/650 Enterprise, but the Envirotex looks like it might work better. Is there any problem with bubbles and the Envirotex? 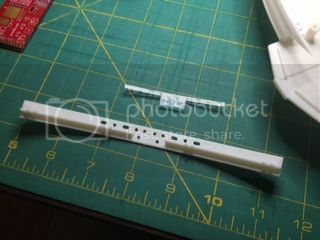 Yeah, I had a lousy experience with acrylic nail/dental powder on my 1:350 TOS E. Couldn't get the windows crystal clear, plus you could see the thickness of the hull plastic which wasn't in scale. I ended up using the white window inserts, individually cut for each one. If you go the clear resin route, I'd first thin the hull plastic around the windows to make the thickness more in scale , and then use a piece of scotch tape on the inside to help diffuse the lighting after the clear resin has cured.